While the issue of child marriages has come to prominence in Europe since the 2015 migrant crisis, it has recently made headlines in the U.S. after the Associated Press uncovered more than 8,000 cases of the American immigration system being used to attempt to facilitate marriages between adults and children. The Associated Press published findings Friday that suggested both the U.S.’s immigration system and marriage laws are enabling child marriages and the resulting sexual abuse of migrant minors in the country. According to ten years of data compiled by the Senate Homeland Security Committee in 2017 requested by the wire service, 5,556 adults petitioned for minor spouses, in one case a 49-year-old man sought to bring in a 15-year-old girl. Nearly 3,000 — 2,926 minors — petitioned for adult spouses while 204 minors petitioned for minors. The country where most requests came from was Mexico, followed by Pakistan, Jordan, the Dominican Republic, and Yemen with Middle Easterners having the highest percentage of approved petitions. “Separately, the data show some 4,749 minor spouses or fiancees received green cards to live in the U.S. over that same 10-year period,” the report continued. Similar systems operate in Europe, where the guidance in some countries is whether the marriage is legal in the migrants’ home country. In overview, Europe appears to be failing to protect the children in its care, and in the following five points could the U.S. learn how to avoid the pitfalls that resulted in the continent’s failures to stop child migrant marriages. In early 2016, asylum centres in Norway were reporting dozens of cases of child brides from Syria, Iraq, and Afghanistan, some as young as 11, with Sweden, which took in the highest number of migrants per capita, also found to be tolerating the arrangement. By August 2016, Germany, which took in the highest number of migrants, was reporting a sharp rise in child marriages after a number of young girls of migrant or refugee background were noted to have disappeared from school. Just one month later, Berlin reported 100 children married to much older men, with government officials expecting that number to rise with the increase of migrants entering the country. The battle to protect the rights of the child began to be undermined early on during the migrant crisis after media was reporting in 2016 that asylum seeker girls as young as 14 were being removed from foster care in Denmark and returned to their adult husbands on grounds that to separate them deprived the couples of their fundamental right to family life, as guaranteed by the European Convention on Human Rights. That summer, a German regional court recognised as valid a sharia marriage between a 14-year-old Syrian girl and her 21-year-old cousin, despite the legal age of marriage in Germany being 16 at the time. The ruling came about as a result of the fact that Germany recognises marriages conducted legally overseas, with the wedding in question conducted according to Sunni Islamic law before the couple arrived in Europe. The girl was returned to her husband, who was granted legal guardianship. Germany then attempted to annul and ban all child marriages and raised the marriage age to 18 in 2017. However, a review of the aforementioned case could see that child protection law struck down as unconstitutional. The Federal Supreme Court ruled that the marriage should be examined on the basis of its legal status in Syria, and that rather than a blanket ban of recognising child marriages, and each union in the future should be considered on a case-by-case basis. Germany’s Basic Law enshrines protection of marriage and family as well as the principle of equal treatment — both of which could be violated under the ban on child marriages. Sweden had also succeeded in making child, and polygynous, marriages illegal — but not before facing opposition from the ruling Social Democrat party, the Greens, and the Left party which sought exemptions to the law in certain circumstances. The leftists had said that it cannot be “ruled out” that child marriage must be tolerated in “exceptional cases” in Sweden whereby “situations may arise in which a child marriage entered into abroad should be recognised so that Sweden can live up to its international commitments. “EU citizens’ right to free movement… could possibly be relevant in this context,” they added. 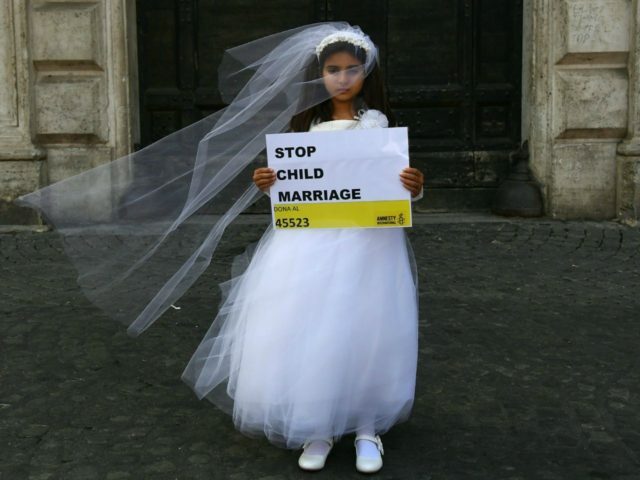 The problem of child marriages is not restricted to recently arrived asylum seekers. European citizens of Muslim migrant heritage continue to be abused by the rules of a parallel society as Western societies fail to challenge, culturally or legally, the practice. Where immigration abuses also come into play is when the girls are sent abroad to be married and remain in their heritage country until they were pregnant before returning home. The young British women would then be forced to petition for their ‘husbands’ to obtain a visa and being both married and pregnant, the applications would have a higher likelihood of being granted. The Times exposed in August 2018 that the Home Office was examining 175 inquiries from abuse victims trying to block spouses’ visas. The report details that some girls under the age of 18 were beaten and raped by their husbands, and then further abused by their families on their return to UK if they refused to sign the visa applications. The same series of reports found that a former Labour party local councillor and immigration lawyer had advised an undercover reporter that there was nothing wrong in forcing a 15-year-old British-Muslim girl to marry in Pakistan against her will. Jasvinder Sanghera, founder of forced marriage charity Karma Nirvana, said that the organisation receives almost 13,000 calls a year to its helpline and criticised the government for failing to act to protect young women and girls because of political correctness. “We’re seeing this nationally. Even when officials know it’s a forced marriage, they see tradition, culture or religion and they’re reticent to deal with it. They are turning a blind eye,” Ms Sanghera said. Like with female genital mutilation (FGM), the abuse of child marriage may find strong support from Islamic and other community leaders. Where mass migration and a failure of host nations to present a strong, Western culture has left a void for parallel societies to develop, the opinions of such cultural leaders are prioritised over the laws and cultural norms of Britain, Germany, Sweden, or the United States. When senior representatives of whole nations approve of child marriages, that could affect the attitudes of its diaspora in Western nations, as well. Turkey sparked outrage in 2018 after the country’s religious affairs state agency said girls as young as nine could marry under Islamic law. There are laws in place to prevent forced marriage in many countries in Europe and the Anglosphere. In recent cases, Syrian parents of a 13-year-old girl were convicted in a Swedish court of attempting to arrange her marriage to an older man. In Australia, a Muslim cleric was convicted for marrying a 14-year-old girl of Bosnian heritage to a man 20 years her senior. In 2017, Breitbart London reported that just one in 30 cases of forced marriage are leading to a prosecution, with only two convictions, against parents, made in 2018 — both of which were against girls who had just turned 18. Figures from August 2017 showed calls to help centres from children fearing forced marriage was at a record high, with some of the victims as young as 13. The NSPCC (National Society for the Prevention of Cruelty to Children) said that many children fear violence or community ostracism if they speak out, or refuse to marry. These handful of convictions are a drop in the ocean, given the thousands of reported cases of suspected child marriages and the thousands more that are not reported.